Hundreds of Filipinos turned up at the Phlippines missions in the UAE yesterday to vote on the first day of the month-long elections. 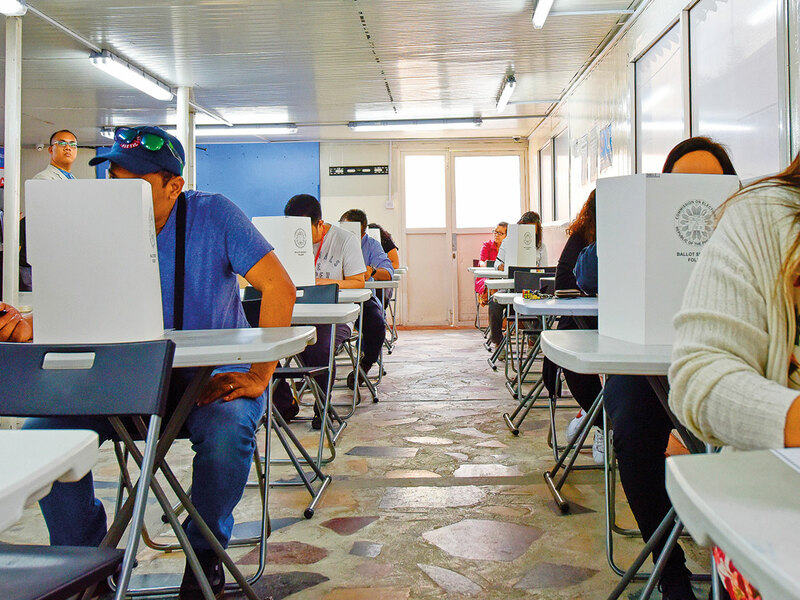 Overseas voting in the UAE and in all Philippine missions worldwide will run until May 13, the election day in the Philippines, to give the 318,862 registered Filipino voters a chance to cast their vote in the mid-term elections this year. The UAE’s registered voters represent roughly 18 per cent of the 1.78 million Filipino voters worldwide. More than 300 Filipinos took advantage of the weekend and exercised their right to vote at the Philippine Consulate-General in Dubai — the foreign post with the largest number of registered voters — as of 2pm on Saturday. Approximately the same number of voters was expected in the capital. Filipinos will be voting for 12 senators and one party-list representative. “Compared to the 2016 presidential elections, we had a sparse crowd today which is expected as the voting populace has more interaction during presidential elections,” Consul-General Paul Raymund Cortes told Gulf News. The first Filipino to cast his vote yesterday was Mandel Dela Cruz who came early at 6.30am. The exercise took him less than five minutes to complete. “The process was very good and smooth. I came here at 6.30am so I can vote early and then perform my duty as a volunteer,” Dela Cruz, 51, and admin in-charge, told Gulf News. A steady stream of four to 10 voters arrived every 10 to 15 minutes during the first five hours of the elections. Among them was Erwin Gutierrez who was grateful to the government for allowing the elections to be held overseas. “I set my alarm to remind me that today is the first day of elections. This exercise is not for the government. This is for us,” Gutierrez, 38, operations manager in a shipping company, said. Fe Ellevera, Shakespeare Canlas, and Floriza Gatagata carpooled to the consulate to ensure their voice was heard through their votes. It took them less than five minutes to vote because they came prepared. The whole day went smoothly except for a minor glitch when one vote counting machine in Dubai had to be replaced due to an error. Before voting, check your name in the Certified List of Overseas Voters on both missions’ websites. They are also printed and displayed at the missions. If you renewed your passport during the registration period last year, chances are they registered you as well. Bring with you a valid ID (Emirates ID, Voter’s ID or passport) and to come prepared with your list of candidates. Completely shade the oval-shaped space allotted before the names of the candidates of your choice. Only 12 senators and one party-list group can be shaded. Do not over shade. You can have less but not more than the required number of candidates or your ballot will be rendered invalid. "Due to the demand of some of our fellow Filipinos to prom the polling precincts on 18 and 19 April 2019, the Commission on Elections in Manila has instructed all foreign service posts to open on these religious holidays. The embassy in Abu Dhabi and consulate in Dubai and will now be open every day from April 13 to May 13. 2019.